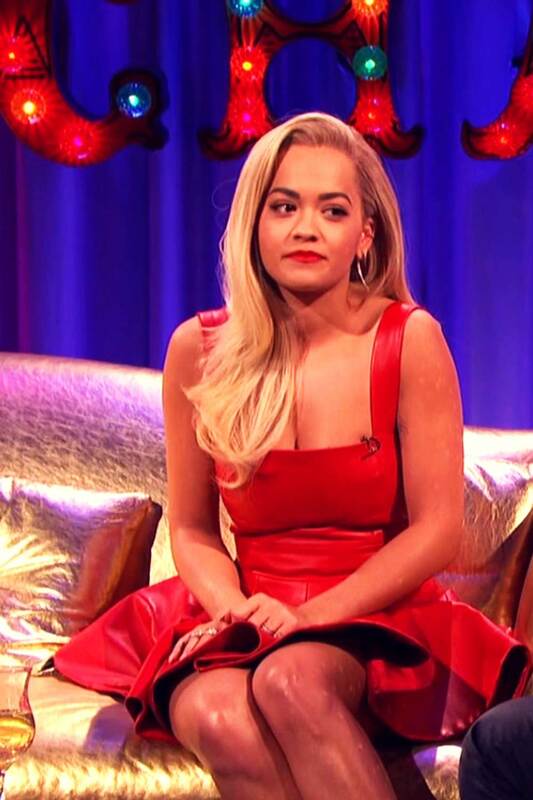 Singer Rita Ora looked red hot as she made an appearance on Alan Carr Chatty Man on 20th November, 2015. The 25-year-old chose a stunning red leather dress for her appearance on the show. Rita totally wowed everyone with her impressive look. Rita was wearing red leather mini dress. Her dress featured a low-cut neckline and highlighted her toned frame perfectly. She paired it with a pair of stunning gold heels, and added some flair to her look with gold jewellery. Rita looked drop dead gorgeous! She was wearing her luscious blonde tresses over her shoulders, while she sported a full face of makeup, finishing out the look with a hint of shimmering eyeshadow, lashings of black mascara, a swipe of peach bronzer under her cheekbones and a dash of red lipstick.